Long acting injectable aripiprazole for bipolar one patients has been shown to significantly reduce the risk of a recurrence of a mood episode in a 52 week placebo controlled clinical trial. Poor adherence to treatment is a significant problem in patients with bipolar disorder, putting patients at increased risk of recurrence of mood episodes, hospitalization, and suicide. One other study of a long acting injectable atypical antipsychotic using the same placebo controlled design has been published. That study found that long acting injectable risperidone (which involved injections every two weeks) was associated in a significant reduction in mood episodes during a follow up period of up to 2 years. How do these two agents stack up? Aripiprazole requires fewer injections. Injections are monthly instead of every two weeks. Both seemed to be comparably effective. See the comparisons of time without mood episodes (versus placebo) in the two graphs. 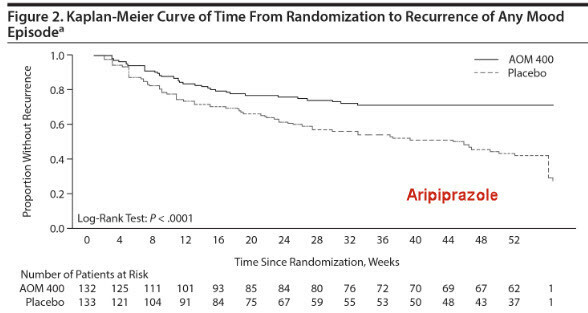 Note that the aripiprazole study was only 52 weeks long as compared with the longer risperidone study. 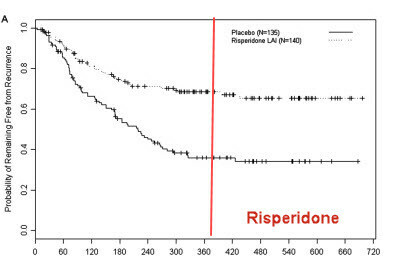 We have drawn a red line to indicate the 52 week mark in the risperidone study. Surprisingly, risperidone seemed to be less likely to cause treatment emergent extrapyramidal side effects (EPS) such as parkinsonism and akathisia. Oral risperidone is associated with more EPS than oral aripiprazole. Both had comparable low rates of weight gain. 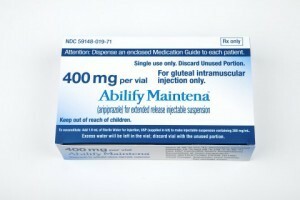 Aripiprazole long acting injectable (Abilify Maintena) is more expensive. Calabrese JR, Sanchez R, Jin N, Amatniek J, Cox K, Johnson B, Perry P, Hertel P, Such P, Salzman PM, McQuade RD, Nyilas M, Carson WH. Efficacy and Safety of Aripiprazole Once-Monthly in the Maintenance Treatment of Bipolar I Disorder: A Double-Blind, Placebo-Controlled, 52-Week Randomized Withdrawal Study. J Clin Psychiatry. 2017 Jan 31. doi: 10.4088/JCP.16m11201. [Epub ahead of print] PubMed PMID: 28146613. Quiroz JA, Yatham LN, Palumbo JM, Karcher K, Kushner S, Kusumakar V. Risperidone long-acting injectable monotherapy in the maintenance treatment of bipolar I disorder. Biol Psychiatry. 2010 Jul 15;68(2):156-62. doi: 10.1016/j.biopsych.2010.01.015. PubMed PMID: 20227682.